The image of fluffy, baby kittens will put a smile on most anyone’s face. Yet, their energy is almost as boundless as their cuteness. The adage of “curious cat” must have come from kittens as they’re excited to explore every nook and cranny in an effort to discover their new world. Seemingly unafraid of heights or dark corners, kittens rarely take “no” for an answer. Of course, all this activity means they’re hungry. Couple that with their growth rate and you might feel like you’re spending all your time either keeping the kitten from climbing the drapes or keeping the food bowl filled. This is normal for a kitten, especially in the first months. The early, rapid growth of the typical kitten will give you an idea of their nutritional needs: “Kittens typically grow eight times their size in just about eight weeks,” and they generally continue to “grow rapidly until 6 months old” (source). Kittens not only need to eat more than adult cats, but they also need more protein and fat than adult cats, which is why we recommend special kitten food for your new kitten. If you feed your kitten adult cat food, she won’t get the right balance of nutrients. Conversely, if you feed your adult cat kitten food, he’ll get too much protein and fat - not to mention calories. Kittens are usually weaned around 8 weeks of age, before they would be adopted into your family home. So your new ball of fluff should be able to chew her own food. Feeding wet or a mix of wet and dry food may make it easier for her to continue the transition from mother’s milk (or a substitute) to kitty food. Kittens tend to snack throughout the day to keep up their caloric needs, but an older cat doesn’t need as many calories. You may want to “free feed,” or keep food out all the time to let your kitten meet her nutritional needs. 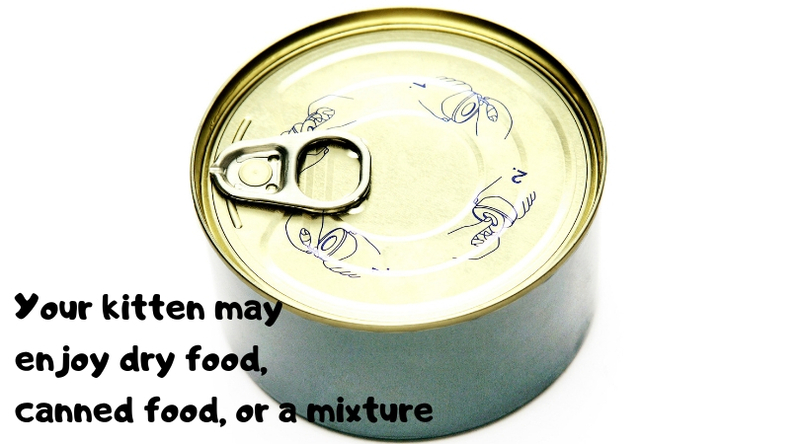 However, if you have older cats in the house, you’re going to want to make sure they don’t eat the kitten food. More on managing meal times in multiple cat households in a moment. During your kitten’s series of early wellness visits, we’ll talk about her growth and specific nutritional needs. Don’t forget to make those appointments! With so many brands of kitten food available, how do you choose? Start by looking for one specifically formulated for kittens in order to meet their nutritional needs. You can look for the Association of American Feed Control Officials (AFFCO) seal, and better yet, be sure to discuss your options with your veterinarian when you’re at your next visit. Typically, you’ll feed kitten food until your kitty is around a year old. By then, they will have achieved their “adult” size. What if you have an older cat (or two) when you bring in a kitten? So you brought home a kitten, and you know you don’t want your adult or cat to eat the high-calorie kitten food. What do you do? You can designate a special place where the kitten can eat in peace but the older cat can’t access. 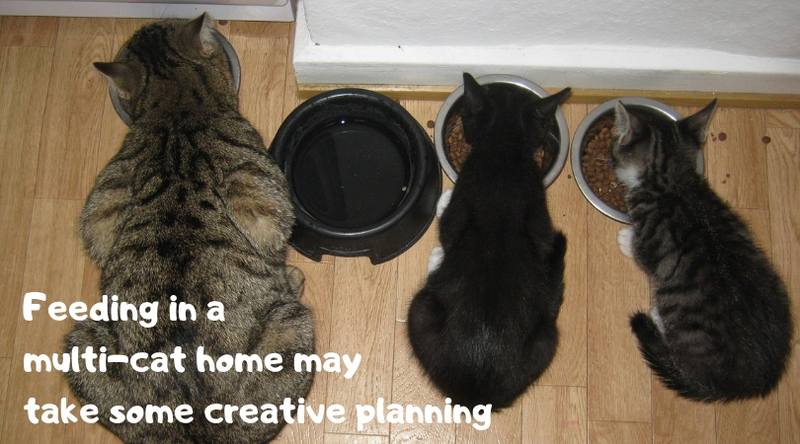 You may need to be creative in finding a space where you can leave a bowl within reach of your kitten, but out of reach of your older cat. Maybe you keep the two cats totally separated during feeding time, feeding the kitten in a completely different room than your adult cat. So you may need to conceive of some household “management” to make sure the kitten gets the food he needs. How might you tell that you’re providing the right nutrition for your new furry friend? A healthy kitten will be bright-eyed and energetic. She’ll have a glossy coat with bright eyes. You’ll also see her steadily grow in size. Of course, you can always check with your veterinary team because kittens will visit the veterinarian every few weeks for regular check-ups and vaccinations in these early months. You can ask any kitten food questions then, or you can contact us between visits. Do you need to schedule your new kitten for his appointment?